Breaking down the actions in the United States that I expect from "Grow, Cut and Print or Default,"
Milton Friedman taught that inflation is "Inflation is always and everywhere a monetary phenomenon (A Monetary History of the United States 1867-1960 (1963))." Bernanke agrees with him. He was right. Let's see how we're doing on working our way out of US debt by inflating away future claims of US treasury owners. September 2010 M2 trailing twelve months growth was 6.3% according to the Fed. Bernanke just dumped another $500 Billion on top (less what gets mopped up in increased bank reserves) or somewhere around 5% of M2. 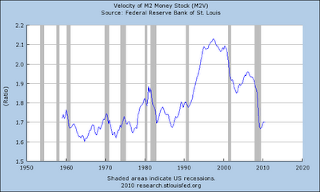 The St. Louis Fed says Velocity dropped from 1.95 (early 2008) to 1.68 (09Q4) over the course of the recession. This is roughly 14%. Starting in 094Q and occuring during the next year - over a period of two years - it will get back to somewhere 1.8, a further run of nearly 6%. 2010 Q3 8709 x 1.7 = $14805 or +4.01% - feels better doesn't it? 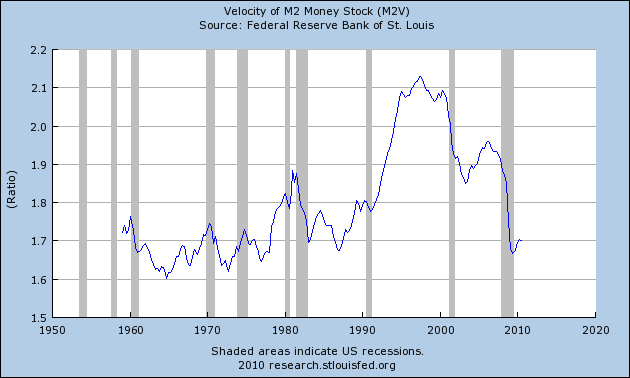 2011 Q3 9666 (equals 10Q3 + 6%ttm growth repeated + 5% Bernanke) * 1.8 (recovery of velocity) = $17400 or + another 15% - this should be a very, very hot economy with inflation booming. Accurate Reality: The Fed has set up a significant inflationary cycle. It should appear during the next year. This will help the US significantly deflate the claims on the US Treasury from owners of Treasury securities over the next decade, making them horrible investments and allowing the US to recover from its debts without defaulting, provided we also grow and cut. 1. Higher inflation almost certainly kills off new nuclear power or clean coal technology and thus new baseload generation that may be needed to support economic growth. Renewable energy cannot fill that gap under any growth scenario so we will surely build natural gas combined cycle power plants. So good for gas and bad for nuke, coal and renewable energy. 2. US imports 12 million barrels of oil per day and higher inflation wreaks havoc on trade balances and prices. New energy policies should encourage domestic oil and gas production especially from unconventional sources needed to feed gas power plants with domestic supplies. 3. Energy efficiency standards adopted by California when Jerry Brown was first Governor Moonbeam have worked reducing energy intensity to 50% of national average. Expanding energy efficiency standards to rest of the country makes sense.